Should You Date Your Co-Workers? Dating in the workplace: Fire.....or fired? We discuss the age old question of whether it's a good idea, give tips for how to do it right if you're gonna do it, and share our own experiences with getting off at the office. Then we bring in Jared Freid and Jordana Abraham of U Up? podcast (one of our faves) to play a very special round of Is This Weird? Rayna and Ashley also give updates on their quests for men in uniform. Listen to U Up? wherever you listen to podcasts, and follow them on Insta @UUpPod. 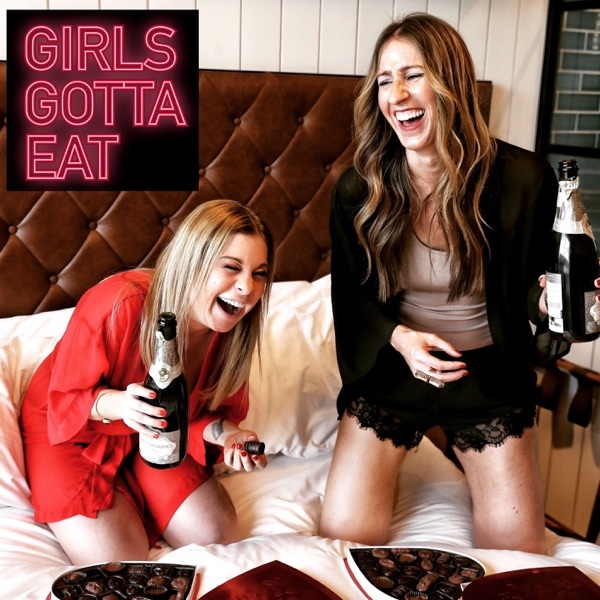 Follow Girls Gotta Eat @GirlsGottaEatPodcast, and check our website for upcoming live show dates! How do you know when you meet the right person? We're chatting with ultimate girl crush Eden Grinshpan (restaurateur and host of Top Chef Canada) about getting engaged within weeks of meeting her husband and how they're still killing it (with a kid) six years later. We also discuss the illusion of perfection on social media, the best country to meet men, nightmare dates, and the secret to "having it all." And lastly, we play a game of Psycho or Power Move and dissect some confusing (but not surprising) male behavior. Enjoy! Follow Eden on Instagram @EdenEats and check her out on Top Chef on Food Network Canada. Thank you to our partners for this episode. Betabrand: Go to betabrand.com/gge to get 20% of your Dress Pant Yoga Pants. Living Proof: Get a free sample of dry shampoo with your purchase at LivingProof.com/gge + promo code GGE. Zola: To start your free wedding website and also get $50 off your registry, go to zola.com/gge. HelloFresh: Get $80 off your first month by going to hellofresh.com/gge80 + use code GGE80.